Artwork from the show's first DVD release. 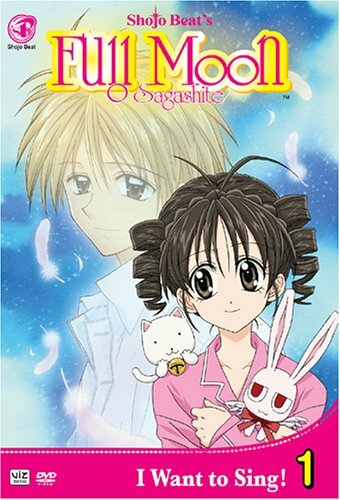 Full Moon o Sagashite is a Japanese animated adaptation of Arina Tanemura's 2002-2004 shōjo manga of the same name. Produced by Studio Deen, the series ran for 52 episodes on TV Tokyo between April 2002 and March 2003. Viz Media licensed the show in 2006 for a North American release. The company commissioned an English-language dub by Ocean Productions, which was recorded in Calgary, Canada at Blue Water Studios. In April 2008, after releasing seven bilingual DVDs, which encompassed the first 28 episodes, Viz confirmed the DVD release of the series had been cancelled. The company began streaming a subtitled Japanese version of the entire show on Hulu in July 2011. Despite Viz having only released the Japanese version in its entirety, there are multiple indications that the English dub was completed. On May 26, 2009, the 52-episode series was approved as Canadian content by the Canadian Radio-television and Telecommunications Commission. Chinook Animation, the casting agency used by Blue Water Studios, lists their involvement with the show as having been over 52 episodes. This is also reflected on Blue Water's website. Lastly, the (since removed) Hulu streams of the Japanese version reportedly credited various English crew members for specific roles in episodes beyond the initial 28. ↑ NYCC - Viz Video Retrieved 30 Oct '18. ↑ Viz Plans Hunter X Hunter Release in DVD Season Boxes Retrieved 30 Oct '18. ↑ Hulu Streams Full Moon o Sagashite Beyond U.S. DVD Release Retrieved 30 Oct '18. ↑ List of CRTC Canadian Program Recognition Numbers Retrieved 30 Oct '18. ↑ Blue Water Studios Retrieved 30 Oct '18. ↑ Pile of Shame - Full Moon O Sagashite (2/3) - Forum - Anime News Network Retrieved 30 Oct '18.